Gesture Variation Follower (GVF) is a cross-platform, open-source C++ library for realtime gesture recognition and variations estimation. In other words, the library provides methods to easily learn a gesture vocabulary, recognize a gesture as soon as it is performed, and estimate its variations (e.g. in scale, orientation, or dynamic). 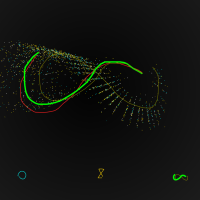 It has been designed for human-computer interactions (HCI) mixing discrete and continuous commands, and specifically for creative applications such as controlling sounds and visuals. ofxGVF is an open source library, under the LGPL v3. It is an openFrameworks add-on, but the same library is used to build Max/MSP and PureData objects, available online. Installation and API are detailed on the Github repo webpage. For any further information see below. The library itself has been designed and developed in 2011 at Ircam Centre Pompidou Paris (STMS lab Ircam-CNRS-UPMC) by Baptiste Caramiaux and Nicola Montecchio (University of Padova) It has been extended at Goldsmiths College, University of London, by Baptiste Caramiaux. The add-on version has been initiated and greatly developed by Matthew Gingold.